Your kids can have the Disney Frozen themed party they’ve been dreaming about! This huge Frozen 5 in 1 combo moonwalk packs as much fun as possible into one very cool inflatable. 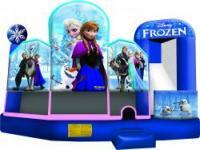 Make your next party as unforgettable as the Frozen movie with this combination adventure bouncy castle.The interior jumping area offers a basketball hoop and both log and pop-up obstacles. This bouncy castle has an exciting climb feature and a convenient exit slide for hours of active fun!